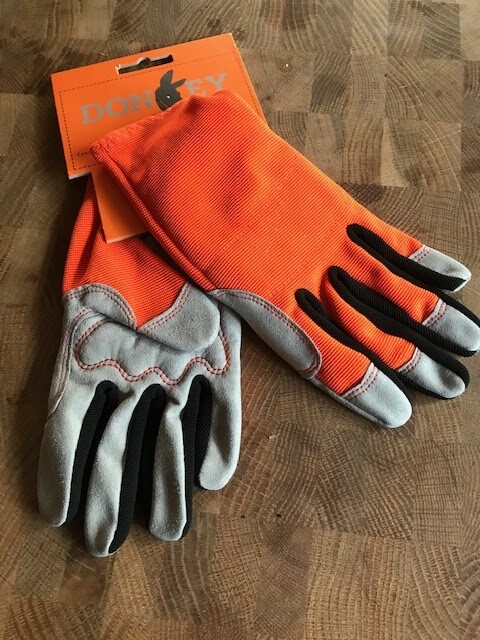 I was recently asked by the nice people at Donkey Works if I would like to trial a pair of their gardening gloves. 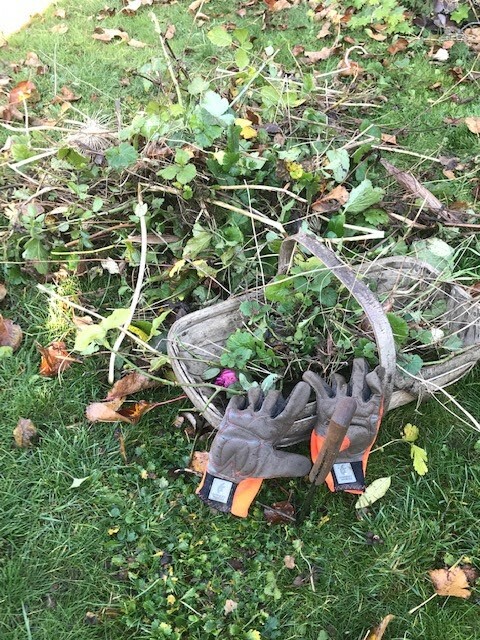 Now I think it is impossible to have too many gardening gloves, so I happily said yes. I must be clear that I did not pay for these gloves but as ever my words and opinions are my own. The gloves quickly arrived and looked beautiful. I tried them on and the ‘Small’ size fitted my hands perfectly. 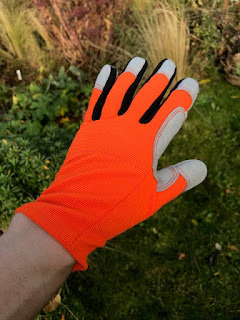 They have a nice elasticated cuff that means that they fit snugly so that bits will not creep down into the gloves (tell me it is not just me who ends up with bits of garden in their gloves if I am not careful?). They also have nice breathable backs and sturdy palms and fingers made of synthetic fibres. Yes it does look like leather, to be honest it feels a lot like leather too, but I was assured that there are no actual donkeys involved in the making of the gloves (phew). The company also try and use recycled materials where they can. They are also handily hi-vis. If like me you cast your gloves off to do something then look around and they have disappeared, these will stay in view as they are delightfully bright orange on the backs. Beautiful and clean they may look as new, but we all know that getting them dirty is the real test. 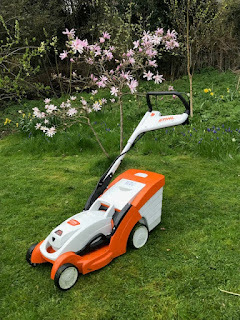 So the next weekend I went out into the garden to get on with some weeding. It was a soggy wet day and so this was a good test for them. The end result was a very dirty pair of gloves. 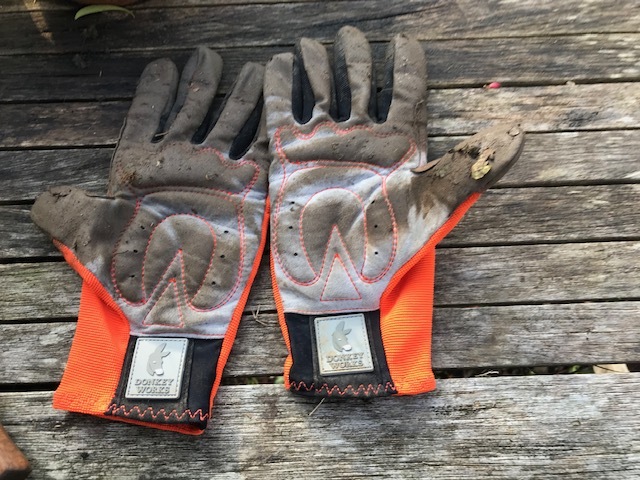 Apart from dirt they were unphased by the weeding, they stood up well to my couple of days in the garden and I am not a softly-softly gardener. 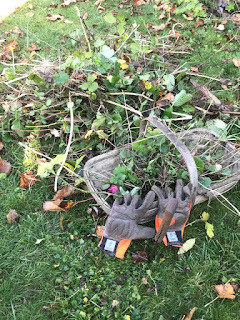 I have a lot of tough weeds so nettles were grasped and brambles tugged at. The one thing I do have to say is that the gloves are not completely water-proof. It was a really cold wet day when I was in the garden and I think it was probably too wet to have been attempting to garden. I would defnitely recommend these gloves and if you were looking for a gift for a gardening friend I do not think they would be displeased with them. 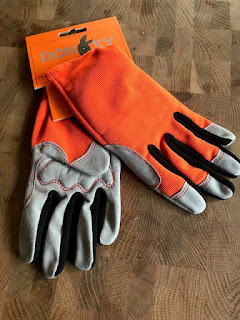 The very nice people at Donkey Gloves have asked if I want to give away a couple of pairs of gloves. I had a think about this and I decided I would ask you to use the contact form on the home page to send me a message saying why you would like a pair of these lovely gloves. I will pick the winner randomly on the 4th December 2018 and email the winner on the 5th December 2018. Entries will only be valid if received through the contact box. - No cash alternative is available and all prizes are non-transferable and non-refundable. Prizes are not for resale and cannot be used for commercial use or use in further promotions. - No cash alternative or alternative prize is available on request, but in the event of the advertised prize being unavailable we reserve the right to offer an alternative prize of equal or greater value. - Employees of any company associated with a specific promotion, and their families, are not eligible to enter. - Proof of sending comment/email is not proof of our receipt of your entry. - No responsibility can be accepted for entries that are lost or delayed. - Winners will be formally notified within 7 days of the closing date and advised how they will receive their prize. Only the winners will be contacted personally. - The prize may not be transferred to any other person. - The prize must be collected, if appropriate, within one month of notification. - Full details of the prize will be given in writing upon request. - Winners may be required to take part in or co-operate with publicity. - Entering implies acceptance of these rules. 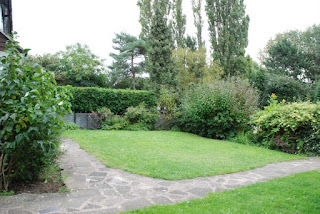 - The prize winners will be selected at random by the Blackberry Garden. Their decision is final in every situation, including any not covered above and no correspondence will be entered into. - In the event that any winner refuses a prize, or for whatever reason, cannot accept a prize, or if the promotor is unable to make contact with any winner within 7 days of the closing date, the promotor reserves the right to re-draw the prize and award to an alternative winner. - The promotor reserves the right to cancel, amend, terminate or temporarily suspend this promotion in the event of any unforeseen circumstances or technical reason outside its reasonable control, with no liability to any entrants or third parties. 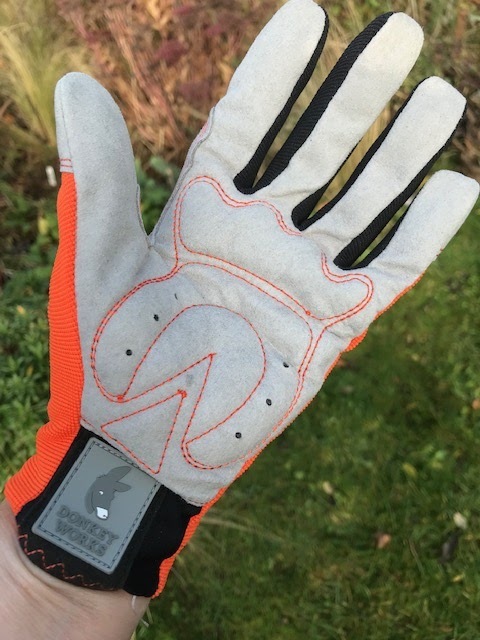 The prize draw is now closed for the giveaway of two pairs of Donkey Gardening Gloves. I am delighted to announce that Barbara Waller and Margaret Ogden have won a pair each. I have contacted the winners through email. Thanks again to all who entered.